The Karaye NYSC orientation camp, Kano was turned into a battlefield on Friday, owing to a tensed fracas that erupted between the corps members and the military personnel in charge of the camp. The crisis, which was reported to have been caused by the high-handedness of the the camp commandment, was said to have lasted for few hours in the late hours of yesterday. Tribune online gathered that the corps members were at the multi-purpose hall for the social event when the commandant went to fish out some corps members that were staying behind in their platoons. The commandant reportedly asked the corps members that were caught to crawl on granite together with some other outrageous penalties. 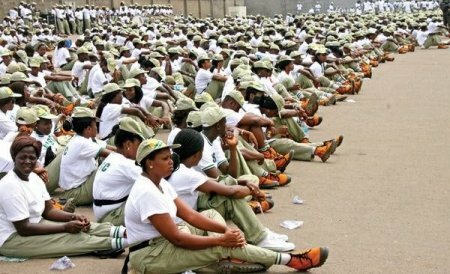 It was reported that some corps members fainted in the process with the commandant ignoring them. “The height of what looked like an assault was when the commandant slapped a corps member and that one retaliated in like manner. “The commandant then wanted to attack him before we all repelled, thus leading to a protest,” a corps member anonymously said. While speaking with the Tribune online, another female corp member reported that the crisis was not just a result of what happened yesterday, but an accumulation of the result of the inhumane manner at which the camp commandant has been handling the corps members in the camp. It was gathered that normalcy later returned to the camp when the NYSC state coordinator came to addressed the them and promised them immediate decampment of the camp commandant as demanded by the corps members.